So, you want a heat gun but don’t want to commit to the full heat gun experience. No problem! 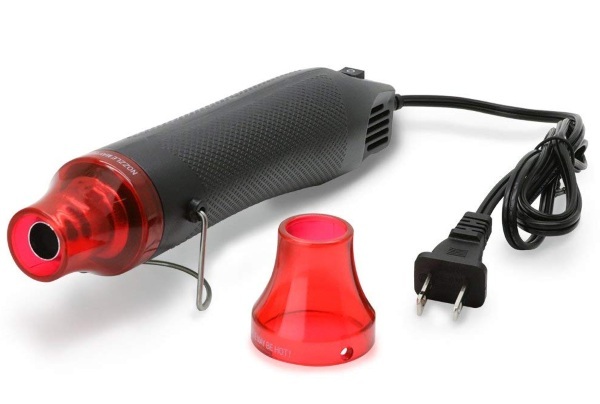 The Portable Mini Heat Gun is all you need for all your small time heat gun projects. Whether you’re drying paint or shrink wrapping, this pocket size tool has got you covered. Plastic on the outside, it’s nonskid so it won’t slip from your fingers easily. It also won’t heat up and burn you, the hot part is only on the front and that can get up to 200 degrees. Heat guns get really hot, in case you didn’t know. These aren’t blow dryers. You can use them for small projects or just to have on hand for emergency thawing situations. There is no temperature control, just on and off but it’s easy to use and store for the hobbyist. You can get one of these for $11.99.